Manchester United manager Jose Mourinho has admitted that he is unsure whether the club will pursue new players when the transfer window reopens at the turn of the year. The Red Devils have experienced one of their worst-ever seasons in the Premier League and they are currently 19 points off arch-rivals Liverpool, who are leading the standings. Amidst this, there has been the speculation of United spending a world-record fee for a defender to recruit Kalidou Koulibaly from Napoli but that does not appear the case as per Mourinho's comment. 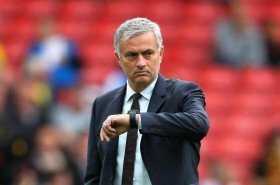 In a report covered by The Mirror, Mourinho suggested that he has no idea whether there would be new additions in the New Year, he said: "I don't know if we are going to have new players – I would like to – but I don't know if it is possible or not. It depends on the club." United's recent defeat to Liverpool also saw them lose further ground on the top-four positions and they are currently 11 points behind fourth-placed Chelsea after just 17 games into the campaign.